In winter, we usually think of hunkering down, staying in, and slowing the pace. But even when Dallas got colder than Antarctica, crews were hard at work building the ICR Discovery Center for Science and Earth History! But the crews’ faithful perseverance is paying off. 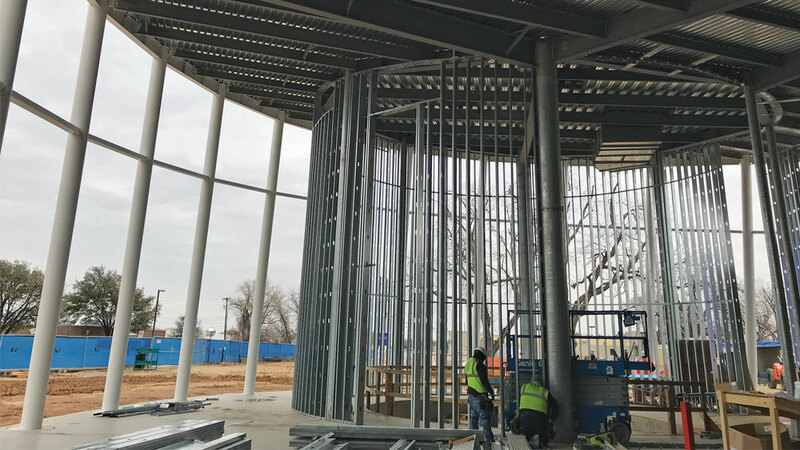 The planetarium’s interior and exterior walls are nearing completion. You can see the planetarium framed out in these photos—it’s the circle of steel beams within the larger ellipse of the structure. The builders pictured in bright orange and green help show the scale of this project. Advanced Animations is constructing several animatronic creatures for us. The animals will appear in the pre-Flood world, Ark, and Ice Age exhibits. You may even spot a few in the lobby. Please visit ICR.org/Construction-Progress to see how far we’ve come! As we build the discovery center, we still need funds for the interior exhibits. We’re working to develop the most educational and moving exhibits possible. Your gift will help us bring this vision to fruition. Together, let’s point people to the truth of our Creator, the Lord Jesus Christ. Article posted on February 15, 2018.